Earlier this month, I wrote a post on why recent pronouncements from Nintendo and Sony show they don’t even understand the threat they face. Having read The Black Swan, I am a great believer in searching for disconfirmation. Once you have identified your thesis, stop trying to prove it; start trying to disprove it. It is so easy to keep seeing evidence that supports your beliefs; anyone who wants to think critically should adopt the opposing position as a way of challenging their biases and preconceptions. Sony offers a free virtual world to all PlayStation 3 users, and has done since the early days of the platform. Originally conceived as a place where brands can showcase their products, it has evolved into a platform in their own right. Companies such as nDreams (Disclosure: I own equity in and sit on the board of nDreams) and Outso have launched virtual spaces and games such as Aurora and Sodium with high production values and huge appeal to their committed fans. Now Sony is investing further into the platform. They have 17 million users (perhaps more accurately, 17 million PS3 users have visited the platform). They are investing in making PlayStation Home more indie-friendly and I’ve been told to expect more announcements in 2011. PlayStation Home is a free-to-play virtual world in which users can chat to their friends and which has an in-built microtransaction business model. While I don’t believe it can ever be a 3D rival to Facebook (the barriers to entry that come from being required to own a PS3 are too high), it is an exciting and potentially highly lucrative platform. 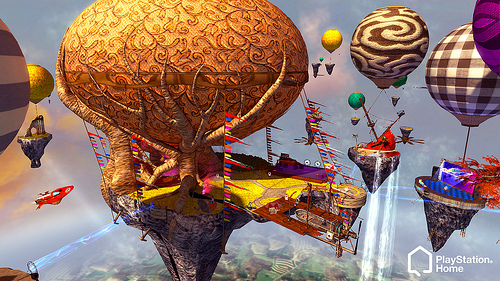 On March 29th, Sony is launching Free Realms as a PSN download. This is a huge step for Sony, bringing a free-to-play game, funded by microtransactions, to a platform that has been dominated by games where you have to pay upfront to play the titles. Of course, Free Realms comes from SCE sister company Sony Online Entertainment. It is highly polished 3D world with at least 10 million registered users. It is a proven piece of high-quality entertainment from within the Sony stable. This is miles away from Facebook’s strategy of throwing the doors wide open to all and sundry. But it’s a great step in the right direction, and a sign of experimentation. Sony has been very vocal about championing independent developers. It has supported them on the PSN (unlike Microsoft, who insists that you need to have a retail distribution strategy for some of the games in your portfolio before you can publish a game on XBLA), it has created the PubFund to help finance independent development and it offers PSP Minis. (A bit of a damp squib, I think, but it shows that they care). On the other hand, they have been very helpful to indies who are the creative lifeblood of the games industry. The initial launch brings a range of PS1 games to Android devices, and Sony believes that it will be great for partners, helping them stand out from the morass of poor quality content available on smartphones. I think that the first pass of Suite will be pretty disappointing. Users who are used to getting long-term experiences for free, with a few users paying a lot of money, are likely to be underwhelmed by PS1 titles for which they have to pay a premium before they’ve really experienced the game. On the other hand, this is a bold step outside Sony’s traditional comfort zone. It is as clear an experiment in whether consumers prefer curation over filtering as I can conceive. I’m glad to see Sony taking the initiative. When I started writing this piece, I was looking for evidence that Sony really did get the threats that they face from the changing market. From virtual worlds to mobile phones, the company is clearly experimenting with different technologies, different business models and different consumer offerings. In short, I think Sony is more aware of the threat that it faces than Nintendo is. It is trying a number of experiments. In my mind, the jury is still out on whether these steps are enough, but I hope they keep experimenting. That will be good for us all.